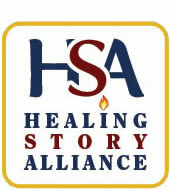 The Healing Story Alliance is a Special Interest Group of the National Storytelling Network. Our purpose is to explore and promote the use of storytelling in healing. There are storytellers across the country (and beyond) telling stories to adults and children who struggle with illness, or grief, addiction or abuse, or any of the challenges in our human journeys. There are many others who do not think of themselves primarily as storytellers, though they know the positive power of story in health care, counseling, pastoral care, and other settings. Through this SIG, we will share our experience and our skills in using stories to inform, inspire, nurture and heal. We will work together to increase our knowledge of stories and our knowledge of the best ways to use stories in service to others. Email Listserv Interactive discussion of topics related to story and healing. Healing Story Alliance membership is $25 per year for members of the National Storytelling Network.